Concrete Pumping is the art of concrete distribution from a mixer semi truck, to the location that it is needed. Concrete mixer trucks have gravity fed slides that have an extremely limited range of delivery. In todays building and construction industry, it isn’t very often that a foundation or walkway has semi truck access to every portion where concrete is needed. Enter the concrete pump truck. Our specialized pieces of equipment have 2" lines that support the concrete pump truck, and can reach up to 300 feet or longer to reach even the farthest corners of your project. 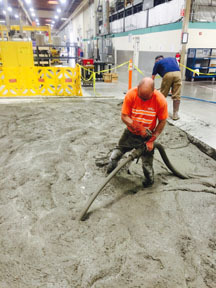 Their high power pumps are able to keep a steady flow of concrete going to your project and save countless hours of ferrying loads of concrete back and forth with wheelbarrows or buckets. Another advantage of concrete pump trucks is the ability to get all of your concrete onsite and in location quickly, allowing the entire project to dry around the same time. This helps to avoid accidents and keep your project moving along quickly. Lakeside Concrete Pumping utilizes a unique 2” pump line set off of their trucks. As oppose to the standard 4” pump line set, these 2” line pump trucks are much easier to navigate to every nook and cranny of your concrete project. At Lakeside Concrete Pumping, we have almost 20 years of experience in the industry and have discovered the beauty and usefulness of our specialized 2” line concrete pump trucks. They allow us to not only do a better job that focuses on quality rather than just speed, but also let us get concrete pumped to areas that are sometimes difficult if not impossible to reach with the standard 4” pump lines. Lakeside Concrete Pumping wants to make a commitment to you. You will never pay for something that isn’t your fault. We will make sure that before our trucks drive out of your driveway, you are fully satisfied with the job that we’ve done, or we’ll work until you are. Wherever your project is, call Lakeside Concrete Pumping today and let us earn your business. 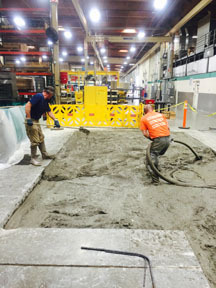 We will show you why we are Western Washington’s #1 concrete pumping service.